Stem cell biology is possibly the most controversial area of research in the life sciences, both within the research community as well as in the public eye. What exactly are stem cells? They are cells that have the choice between forming another stem cell (self-renewal) or a daughter cell which will differentiate into a specific cell type. A real stem cell has this choice every single time it divides (image from here). There are several types of stem cells: the most versatile are the pluripotent stem cells, because they can differentiate into any adult tissue, including the germ-line. The more restricted stem cells are already lineage-specific, such as haematopoietic stem cells, which form all constituent cells of the blood. Earlier this year, a group based at the RIKEN institute in Japan claimed to be able to reprogramme differentiated, adult cells into pluripotent stem cells by simply stressing the cells using a weak acid (Obokata et al. (2014)). These cells are known as STAP (stimulus-triggered acquisition of pluripotency) cells and were an immense breakthrough – until then cells could only be reprogrammed either by transferring the nucleus of the adult cell into an enucleated oocyte (without its own nucleus) or by forcing the expression of certain proteins (transcription factors) that regulate pluripotency. Immediately scientists around the world tried to reproduce these results because it provided a much faster method of working with stem cells. However, essentially nobody could replicate the findings. A crowdsource page was set up to allow researchers to share their experiments online and eventually this led to an investigation of the lead author’s work: the RIKEN institute found that Obokata had falsified/fabricated her results, which is gross scientific misconduct. A few months after this the paper was retracted by Nature, but it is still accessible online. 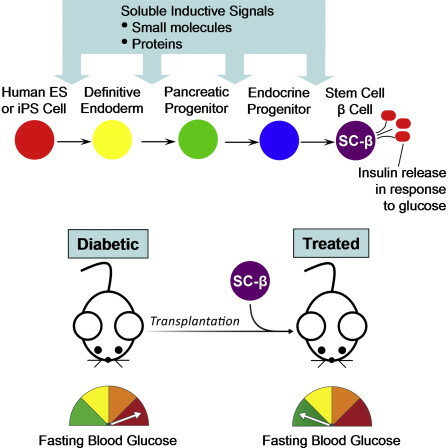 But to end this entry on a somewhat happier note: a couple of weeks ago a group published in Cell that they could convert human pluripotent stem cells into human pancreatic beta cells, the cells which secrete insulin in the pancreas (Pagliuca et al. (2014)). After several steps of conversion in vitro they obtained cells that looked like and behaved like beta cells, which responded to glucose and could secrete insulin. To test whether they also functioned in vivo, they transplanted these cells into diabetic, immunodeficient mice (which do not reject the human cells) and they found that the mice could control blood sugar levels (image from the paper). This finding has enormous implications because it means that patients with type I diabetes, in which beta cells are destroyed due to autoimmunity, might in future be treated with their own reprogrammed stem cells. This entry was posted in Factual, Opinion and tagged biology, Cell biology, Science, stem cells, Translational Medicine by Victoria Wang. Bookmark the permalink. The world’s diabetic population will rejoice at such findings !!! Type 2 diabetics are too given hope because ultimately their pancreatic beta cells are also exhausted and unable to produce insulin (among other factors unique to them) !